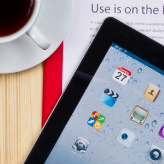 Get more productivity from your iPad - Toronto, Markham, Richmond Hill | SunTel Technologies inc. Ever wish you could get more work done with your iPad? You’re not alone. In fact, one of the main reasons people purchase an iPad in the first place is because they believe it will give them the ability to be more productive while out and about. The reality is that many individuals only end up using it to surf the web or watch Netflix. However, if you still harbour ambitions of making your iPad a productivity tool, here are the three things you need to make it happen. That’s great news, but the biggest productivity benefit of using a stylus is probably more of a mental one than any tangible gain. Holding and working with a pen, or in this case a pen-shaped device, feels more like traditional work and gets you in productivity mode. Since you likely use your fingers to navigate your iPad in more casual settings, this mindset can carry over to when it's time to work. Investing in a stylus can create a clear divide as to when it’s time to work using your iPad and when it’s okay to open up your favorite freemium game and challenge for the high score.